Don't agree? Add your "essentials"! Of particular interest is a series of interviews with Japanese craftsmen, most of whom were active contemporaries in the shin hanga field. Spend some time here with the "Visit to a Craftsman" series, and pay your respects to the very last generation of woodblock artisans -- some of whom have already passed on. Online from May 2001, this busy site offers shin hanga, artists' signatures, Japanese art links, and much more. Another website debuted in May 2002, covering some shin hanga topics: www.ukiyo–e.com. "This portal is THE meeting-place for all those interested in Japanese prints." Also offers areas with Dealers, Sales Windows, Messageboard, and news about Auctions, Activities, and Publications. Dave Bull shows how a modern-day shin hanga style print is created, step by step. Reading the artisan's explanation of each block's importance, you'll appreciate better the care and complexity behind the original shin hanga works. Begin here! Tip: Set your monitor to 1024 x 768. Click on all the steps to load them into your computer's memory, then go back and click through again, in order. As each color block is added quickly, the print will "flower" before your eyes. Got books? You already know about Paragon, Asian Rare Books, ROBCO, and the rest. 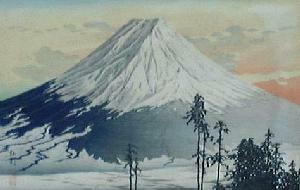 But serious shin hanga collectors also look to the Netherlands for book treasures. Once upon a time, out-of-print, rare and Japanese books were available from Ukiyo-e Books, whose former sister company Hotei Publishing is now a division of Brill and issues new reference books of high quality. Many collectors consider insuring their print collection. If you already have, please let us know of any specialized insurance sources. One such company is Collectibles Insurance Agency, (888) 837-9537. Now available in California! We would be happy to hear about other good specialty links -- let us know! 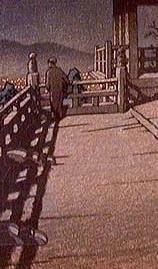 We can also publish highlights from your shin hanga collection: prints, watercolors, books, and ephemera. Just send us the images with description, or let us know where you've posted it on your personal web page. These links open in a (single) new browser window. Why? Most of these sites have extensive further links and adventures, which will take you far away from us, your shin hanga home. So we'll be there at the bottom of your screen, just one click away from a safe and swift return.